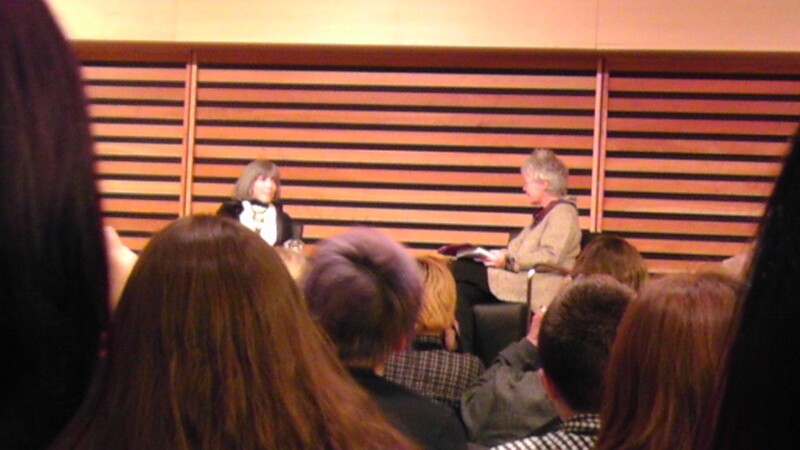 Anne Rice was such a major figure in my teenage years that I could hardly believe I would get to see her in person. I loved her Vampire books, with their tortured, Old World, non-sparkly anti-heroes. I remember once being home sick from school once and just spending the day reading Interview with the Vampire. Seriously, forget the Cullens — if you want to fall in love with a vampire, Lestat and Louis are so much more seductive. I stopped reading Rice when she started writing books about Jesus, just because those didn’t interest me, and, like many of her fans, I was thrilled to find out she’d returned to the supernatural with Wolf Gift. As I expected, tickets to the Appel Salon event were sold out almost immediately. I planned to show up an hour early to get a good seat, but saw on Twitter that a line was already forming three hours before the event! Crazy, eh? Yet that’s the kind of devotion Anne Rice inspires in her fans. Standing in line to get my books signed after the interview, I looked around to see what books others brought. While almost everyone in line had the shiny gold and white Wolf Gift (sold just for us, one day before it hit bookstores!) and one man had a leather-bound edition still in its shrink wrap, many people had somewhat battered, dog-eared copies with yellowing pages. I love that! I saw a book with a cancelled library stamp, and I could only imagine the reader discovering that title at a library’s used book sale. I saw books with creased spines, bent covers, pages that opened naturally to a middle chapter. I also saw books that still looked new, of course, but it was those obviously much-loved copies that caught my eye. How many times have these stories been read? Where have they been read, and how have they touched each person’s life? One woman I met in line told me she had all the available editions of Interview with the Vampire. The story means that much to her. I love that. I love seeing so many people who love Anne Rice’s writing as much, or even more, than I do. I also loved meeting up with fellow bloggers Jen and Jenn at the event! And Jen – thanks for the cookies! I was enjoying them too much to take a photo, but Random House tweeter Lindsey did! I was very impressed by Rice’s interview. She is so articulate and intelligent, which I expected from her writing. I didn’t expect, however, how soft-spoken, almost serene, she is. Asked the inevitable Twilight question, she couldn’t barely stop laughing long enough to give her response: Lestat and Louis would be envious of vampires who could walk in sunlight; they’d love to be able to do that. They’d say, “If you can sparkle, go to it!” She admits she never thought of putting her vampires in high school, but hey, sure they’d want to go back to high school, for twenty minutes, maybe. (Yeah, that’s actually more realistic than wanting to spend a century in high school, right?) She also admits Meyer is a genius, because Meyer figured out what her audience wanted — the idea that the guy sitting beside you in biology is really a vampire! Again, Rice raises an interesting point. I was attracted to Louis and Lestat because I love the idea that there are gentlemen with Old World manners still around, who could look good in a top hat and lace collar and who could whisk me away from the ordinariness of homework and traffic jams. So, facetious though Rice may have been, why not have a classmate in a boring biology class have a fascinating secret? Say what you will to the force that governs the universe. Perhaps we’ll call it into being, and it will yet love us as we love it. This entry was posted in Non-Book Review Posts and tagged Author Encounter, Horror, interview with the vampire, Random House, wolf gift by Jaclyn. Bookmark the permalink. 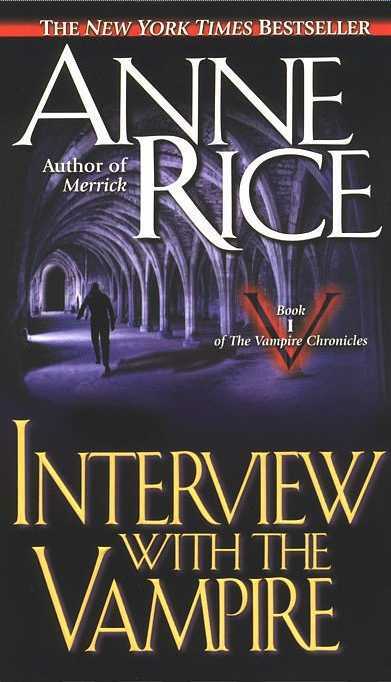 How fabulous is Anne Rice? I am très jealous you were able to go to this event. I’ve just picked up a copy of The Wolf Gift and am super excited to get started on it. Have you read it yet? Have you seen the video of Ann Rice on the I am Second video site. Maybe I have the timeline wrong, but it appears that she has returned to her faith in Jesus Christ? It didn’t seem so when she spoke at the Toronto Library. She’s certainly spiritual, but I don’t think she’s become a Christian again. Perhaps the video was from before she gave up Christianity?